Show off your best jewelry and give your customers something to present their special purchases in with our Black Velvet Pendant Box. 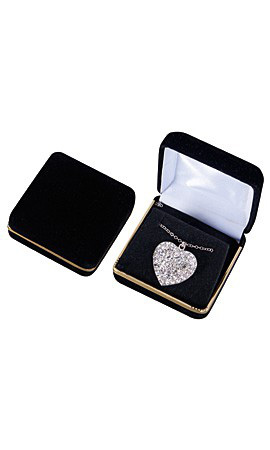 The pendant box is an ideal choice for housing a special piece of jewelry. The box is a metal base covered in black velvet with a gold trim to finish the look. The back of the box is hinged. The inside is notched to tuck necklaces underneath a velvet cover. The inside rear of the box is wrapped in a white covering.